Some of you may remember a 3-part series I did last year called "Baking with Sisters"- well, I'm adding to it! It has become a tradition for my four sisters and I to have a get-together every year (I think this was our fourth year) and no sister time is complete without getting into the kitchen and trying out some new recipes. In this instance, however, it isn't a new recipe, but rather an old one, and one you likely know well. 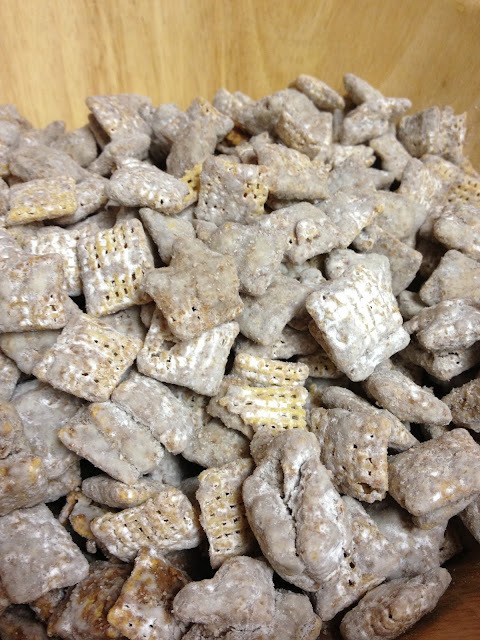 We call it "Muddy Buddies" but some may know it as "Puppy Chow". This is the original Chex version that we grew up with and it is a classic that holds its own! How can you go wrong mixing creamy peanut butter, smooth chocolate, crunchy cereal and a dusting of powdered sugar? It's the ultimate sweet snack that's perfect paired with a chic flick or a Downton Abbey marathon! 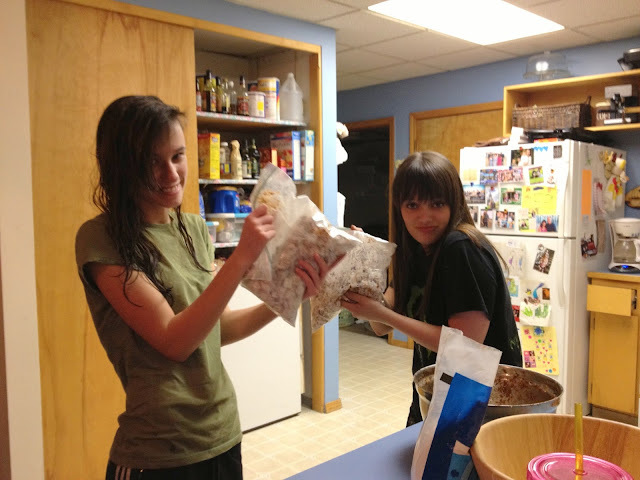 Two of my sisters, of course, fought over who got to "shake the bag" (the fun part!!) so we divided it in half. If you've never given this classic favorite a try, there's no time like the present to make some culinary memories with your kids (or sisters)! It comes together in a matter of minutes and will certainly satisfy your sweet-tooth snack craving! Combine chocolate chips, peanut butter and butter in a microwave safe bowl. Microwave 1 min. Stir. Microwave about 30 sec. longer or until smooth. Stir in vanilla. Pour mixture over cereal and stir until evenly coated. Pour into resealable 2 gal. plastic bag (or two 1 gal. bags). Pour in powdered sugar, seal bag, and shake until all pieces are coated. When cool, store in an airtight container.